This post has been sponsored by the PRIMP Network and PMD. All opinions are my own. 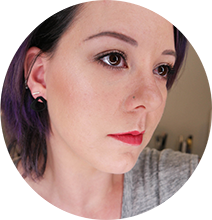 As promised, here I am, back with an update on the PMD Personal Microderm and how things are going with fixing my terrible lack of suncare this summer. In case you missed the original post, the short version is this: after forgetting my sunscreen a few too many times this year, my chest is looking pretty rough, so I’ve been trying out the PMD Personal Microderm home dermabrasion device to whip it back into shape. And of course, as the case always is with high-tech skin gadgets, the real question is – does it work? While there tanned and not-tanned areas are still pretty obvious, a lot of the freckling has lightened up or even disappeared. More importantly, there’s been a pretty big improvement in my skin texture. I’ve still got some visible fine lines in the cleavage area, but not as many, and they’re not as deep. The upper part of my chest is also much softer and not nearly as rough as it was. I think I’m one of those cases where the full 12 weeks will be needed, but I’m really pleased with my progress so far. This weekend I’ll be switching to the green (moderate) disc for even more exfoliating power, and keeping up my PMD routine. It shouldn’t be too hard – the 5-minutes-once-a-week schedule is way easier than some beauty gadgets that need 5 or 10 minutes every single day! Overall I’m really happy with the results, and I’m excited to see how much better they’ll be after another month or so! Think this would be perfect for someone on your holiday shopping list? You can snag one for them (or for yourself, I won’t tell!) for 20% off with the code PRIMP20.